Muralist Judith Baca, a UCLA professor and leader in the community art movement, is being honored by the National Museum of American History, which has acquired several of her personal items related to her work for a future exhibit on migration and immigration. The Smithsonian’s National Museum of American History has acquired personal items belonging to world-renowned painter and muralist Judith Baca that represent her work, including two paints brushes and a signature pair of overalls used when she led the 2011 restoration of the landmark Great Wall of Los Angeles, a mural that the community created in the 1970s under her leadership. Extending along the Tujunga Wash flood-control channel in the Los Angeles River, the mural depicts the indigenous history of the city up until the late 1950s. 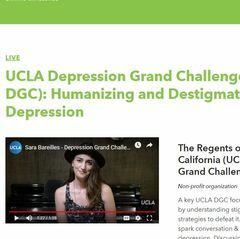 Baca, a professor in the UCLA César E. Chávez Department of Chicana and Chicano Studies and Department of World Arts and Culture, is also co-founder of UCLA’s Social and Public Art Resource Center. She donated these personal items to the museum, which is honoring her work. The memorabilia will help the museum tell stories of how art became an integral part of community-building for a future exhibition on immigration and migration. Other objects include a pair of work boots splattered with paint; two T-shirts, including the one that was used to fundraise for the Great Wall; a baseball cap inscribed with “Baca,” which was a gift from her students; and a photograph of the Tujunga Wash before it became the "canvas" for the mural. The photo was signed by students, colleagues and friends. One of Baca’s works, “Las Tres Maria’s,” is in the collection of the Smithsonian American Art Museum. 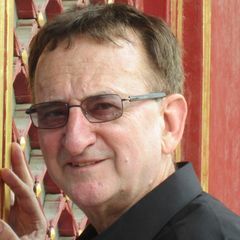 "It is a great honor for the Great Wall of Los Angeles and all of its participants to be recognized in this collection," Baca said in an email. Baca’s art seeks to promote peace among diverse communities, groups and individuals. To do so, she unites people through the creation of art. For example, she brought together four rival gangs to create murals in the Hollenbeck Park neighborhood of East Los Angeles in 1970. She also co-founded the Social and Public Art Resource Center based in Venice, California. 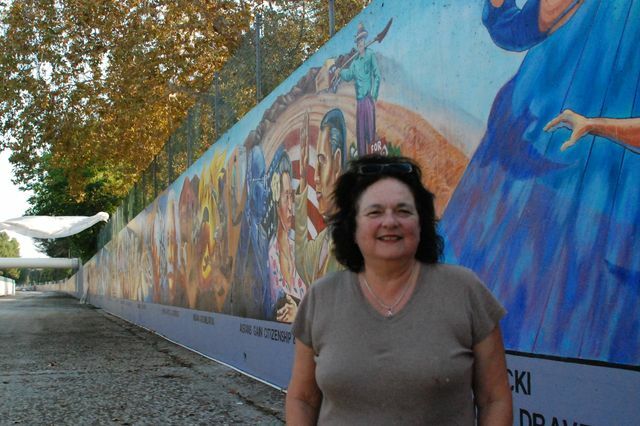 In the 1970s over seven summers, Baca pulled together hundreds of community members, artists, oral historians, ethnologists and other scholars to conceptualize and paint the Great Wall mural, which is considered her signature piece. In 2011, Baca led a new team in an equally daunting restoration of the Great Wall. And a new sense of community was rekindled among muralists, and a new group of young muralists were able to learn from the internationally renowned artist. 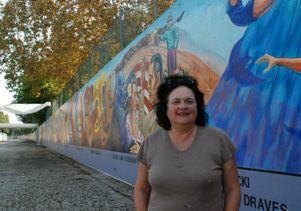 Baca is standing in front of a section of her landmark Great Wall of Los Angeles, which was restored in 2011.